Early wireless age crystal set with code on label. Some pictures of crystal radios are on display below the Links. Headphone Museum Gallery Pictures of collectible headphones from my collection. Several pages of close up photos of vintage headphones. Over 100 different headphone pictured here. Vintage headphones for crystal set use or just for collecting. Several new sets listed including Brandes, Baldwin, and Western Electric. Vintage and Crystal Radios for sale Some quality homebrews and reproductions. 1920's Radio Parts and Test Equipment Tuning condensers, coils, tube sockets, etc. Build your own battery tube regenerative radio, plus various test equipment such as soldering irons, etc. BOOKS And Vintage Radio Magazines for Sale Vintage radio repair, and now with some vintage Radio News and related magazines. New Page of some antique tools I have collected over the years and need to part with now. Draw knives, Depth marking gauges, spiral push drills etc. These are high quality compact binoculars, first designed by Nippon Kogaku Company in Japan (later renamed Nikon). The design from the 1920's was produced for many decades, then abandoned, but Nikon put them back in to production recently and sells them for $250 to $300. Several companies made them in Japan and these have been refurbished, cleaned, and the images aligned for proper visual optics, at a fraction of the price of a new pair of Nikon Mikron binoculars. We finally took a real vacation in August of 2009 and this is a little blog about our holiday there, plus have recently added subsequent family events, water skiing, surfing, and my daughter's wedding in May 2011. Steampunk Headphones Project Page Modify vintage headphones to use on modern audio devices. LINKS A page of links to related radio sites including my favorite crystal radio sites. 1960 Austin Healey 3000 BT7 Restoration Project Uh-oh, another new project. Watch the restoration process on this long term car restoration project. Austin Healey Parts For Sale After restoring a couple of cars I have parts left over that I need to sell so am listing them here. Will be updating this page in the near future with more parts and photos but feel free to contact me to inquire about parts you may need. Ugh, yet another project. Being a sucker for a classic that needs some TLC, I bought a little 15 foot Glastron boat like the James Bond chase boat in Live and Let Die. It needs a lot of work, but will be a zippy little ride when it is done. 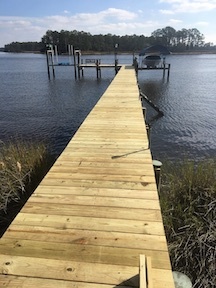 The boat dock was in need of repair and this page shows a little of the process of rebuilding it. A Tale of Two Tube Amps This is a page on the making of a couple of stereo tube amps that I am building for special friends and relatives. One uses a single ended 12AX7, 6V6, 5Y3G design, and the other is a 7 tube push pull design using 6SN7, VT-25, and 5U4G tubes. Sign up for Paypal for quick payment and next day shipping. 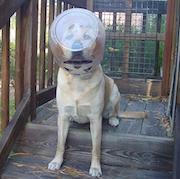 This is just a fun page about our dog Belle. Sort of a Dog Blog. She is no match for Marley in the recent hit novel, but still a lot of fun. April 2010 added a couple of photos of her litter of mutt puppies. Double Doggie House Project The dogs just got a dog house makeover from the old metal wire crates to luxury 2 bedroom apartment! 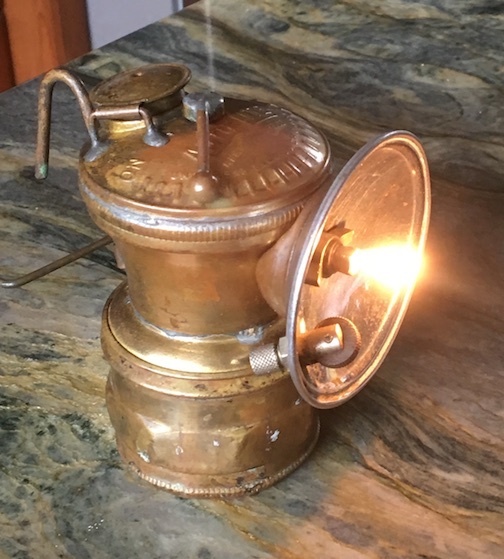 Page dedicated to vintage miners carbide lamps, with a few for sale. Nixie Tube Clock Project Slightly outside of my usual interests, but am documenting this fun project building an old fashioned Nixie clock. Oh No, another new hobby. Just took up pen turning, a fun and inexpensive hobby with rewarding results. Western Electric 509W Restoration Project This page shows the steps in cleaning up a nice vintage pair of Western Electric 509W headphones. Tube Amp Project Page This is a page documenting a project I got started on after I restored a Sparton 1568 console radio with a 2A3 power amplifier. That Sparton sounded to nice that I looked around and decided to build an integrated stereo 2A3 single ended triode tube amplifier. This is a long project, took about 4 months just to get a final version of the schematic and collect the basic parts. Just finished the amp and will get the pictures up soon. Make your Own Root Beer This is a page on fermenting your own home brewed root beer. Heathkit CR-1 and Miller 595 Page This page shows the circuit of the famous Heathkit CR-1 and Miller 565 / 595 crystal radios and a project in progress to recreate these sets with parts available today. Headphone Repair Page This page will be expanded to include remagnetizing headphone magnets, replacing pin tips, cord splicing etc. Illustrated to help you do it yourself. These are some of my other radios on display. Jackson Bell made elegant figural cathedral radios in the early 1930's. These have nothing to do with crystal sets but I like them anyway. Build A Crystal Radio or a 1 Tube Amplifier This page has the circuit diagram for building a simple crystal radio and a 1 tube amplifier that can be used to drive a horn speaker or amplify weak signals for headphones. Includes a schematic plus a component diagram for easy assembly. The crystal radio Plans are easy enough to use for a Science Fair project or a scout project. Resource Page Links and addresses/phone numbers of the parts suppliers I use to obtain parts. Parts that I don't have can be found at one of these sites. These are pictures of items from my collection of crystal radios and other early radio items. Items on this page are for display. 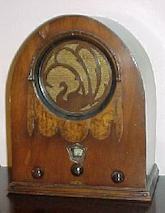 Click on the above line marked "Crystal radios for sale" or others to see items for sale. You can click on a few selected pictures for larger photo and click "back" to return. Most of the below sets can be seen in Maurice Seivers book "Crystal Clear", Volumes 1 and 2. This is one of my favorite sets. 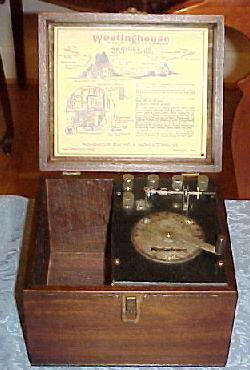 Circa 1922, a good quality crystal set with a two mineral Perikon detector. The little brother of the Aeriola Sr. one tube radio. Simple slider and coil construction, variable inductance, no capacitor. Jubilee Crystal Set made in Omaha Nebraska, mid 1920's. Another coil and slide tuned crystal set. Several sets of headphones can plug into this radio. PANDORA, Black version by Brooklyn Metal Stamping Company. There was a bronze colored version of this also made with a slightly different base. Pictured in Maurice Sievers book on crystal radios, Crystal Clear volume1, page 78. VAN Crystal Set Made by Van Valkenburg Co. in Holyoke MA mid 1920's. 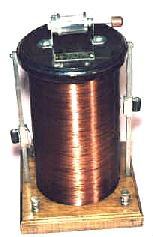 Semi-fixed crystal detector housed in the tubular plastic crystal holder. 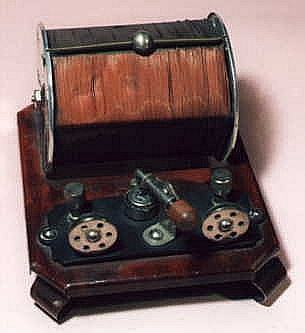 Tunes by sliding the tuning device along the coil inside. This Kleertone set with the enclosed detector and double sliderfrom the early 1920's is another one of my favorite crystal radios. It is about ten inches tall and has hundreds of turns of wire on the coil, must have tuned frequencies up through the long waves. The original set is pictured in Crystal Clear Volume 2 on page 55. This set is one I built to the original dimensions. I made the cabinet of this reproduction is solid oak with the same kind of corner joints as the original. The binding posts, crystal holder, wiper switch and points are all vintage 1920's parts. One of the little screws on the panel goes to a miniature variable condenser for fine tuning (not part of the original circuit) and the 9 switch points vary the coil inductance. This set works great and cover the AM band well. This is my favorite homebrew set and looks very close to the original. Five germanium signal diodes including a 1N-60, and 4 general purpose germanium diodes. All 5 for $5 postpaid within the US. 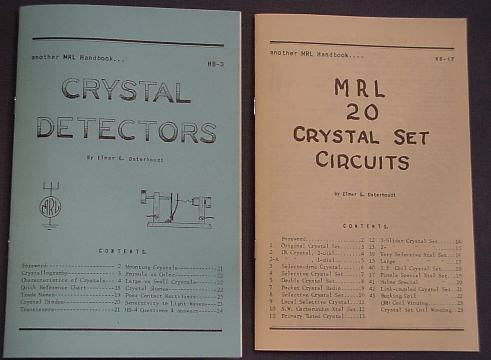 These are great for building crystal radio projects. The 1N60 is particularly sensitive to small signals. 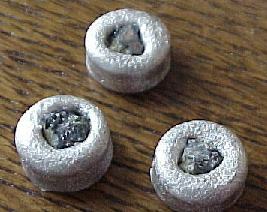 These are excellent quality galena detector crystals mounted in Wood's Metal for a 7/16 inch diameter mounted crystal. Made with fine crystalline argentiferous galena that is the best "rock" I have ever used. 3 for $12 includes shipping within the US by first class for crystals only. If you have bought crystals from other sources you may be disappointed with their performance. Not these! They work great and 100% of buyers have been thrilled with the results. Mount Your Own Crystals Click for instructions. This page is an illustrated instruction page for mounting your own minerals using materials similar to those shown above. These handbooks were kindly supplied to me by MRL. They are $3 each. HB-3 tells all about crystal detectors, including various minerals and modern diodes. HB-17 gives 20 of the most popular Modern Radio Labs crystal radio circuits including the MRL-2 and MRL-2A. It also gives the coil details for the wavetrap QRM coil. Phil's Old Radios Nice general radio website with a great crystal radio project for broadcast and shortwave reception. Xtal Set Society National club with information, links to suppliers, books and items for sale. 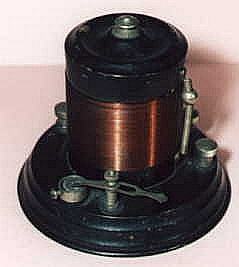 Join the great crystal radio discussion group there called Rap 'n Tap. Skywaves Al Klase's site that has some useful schematics and crystal radio building projects including a shortwave crystal set. Greg Farmer's Crystal Radios Great site with a beautiful collection of crystal radios and related early radios. Dave's Homemade Radios Dave Schmarder has a great website that shows dozens of his creations of crystal radios and some battery operated tube sets including some shortwave sets. He has nice photos and schematics posted for each set. 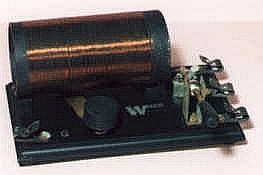 This is a great site to get ideas for how to build your own nice tube or crystal radio. 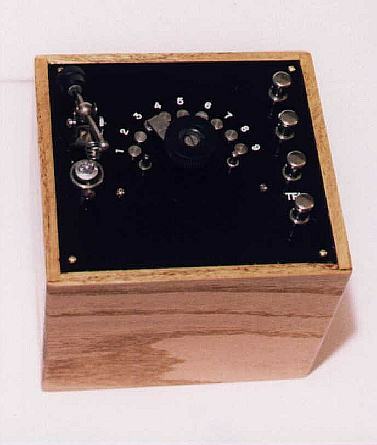 Ben Tongue's Crystal Radio Website This website had valuable details on crystal radio reception, impedance matching, and even schematics for building impedance determination equipment for comparing headphones of different impedances. 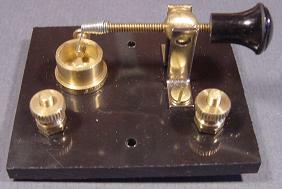 Crystal Radio Resources A great "How To Do It" website for constructing your own sets.This page has an extensive list of crystal radio links and is highly recommended as a resource for serious crystal radio research. A MUST SEE for beginning builders and Science Fair Project builders. Tell Owen I said hello. Crystal Radio Supply This is one of my favorite supplier for parts such as variable capacitors used to build crystal radios, and great prices too. Peebles Originals This is Mike Peebles website with information about Crystal Radio, Tube & amp; Transistor Radio, Parts, Plans, Kits and other Items associated with "Nostalgic Radio Building". 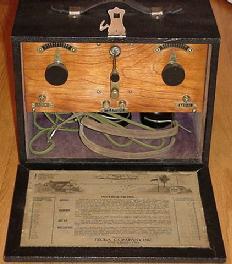 Allens Web Page New site by a radio collector and boat builder, many radio items for sale here. Gollum's Crystal Receiver World The First German crystal receiver website with many photos and hints about crystal radio construction, testing and use. Lance's Crystal Radio Website Lance Borden's Crystal Radio Webapge with plans and kits for sale. John's Radio Pages A great resource that has details about the early Miller high fidelity tuners. Stay Tuned Take this hot link to a related page by a colleague who specialized in sound powered equipment. It has been recently expanded with dozens of crystal radio construction plans.This site is a MUST SEE! Tom's Terrific Tuners This is a page by Tom Kipgen that has homebuilt crystal radios made with beautifully machined parts and true vintage looks, plus vintage looking wook knobs for building radio projects. Many high quality items for sale. The Old Radio Builder This is a nice webpage showing vintage crystal radio projects, modern projects, and old radio restoration projects. Jim Frederick's Crystal Radio Page This page has plans and kits to buy such as the high tech Hobbydyne crystal radio, tell Jim I sent you. Play Things of Past Great source for all sorts of vintage radio replacement parts including tubes, all types of transformers, knobs, dials, glass, belts, variable capacitors, coils and more. I can't think of anything not available here for an old radio and at great prices. Radio Museum A website dealing with all aspects of antique radios including display photos and schematic daigrams for antique radio enthusiasts, click on the icon above to jump to the Radiomuseum.